At the end of your leasing contract, you return the vehicle to the leasing company. During your time with the vehicle, it must be used, maintained and looked after according to the manufacturer’s guidelines. When you arrange for the car to be picked up, a representative of the leasing company will check its mileage and general condition. End-of-lease charges only occur when the vehicle, its equipment or accessories are not used, maintained or looked after as originally agreed. They merely compensate the leasing company for the cost of rectifying damage or loss. The British Vehicle Rental and Leasing Association (BVRLA) Fair Wear and Tear Guide is an industry-wide, accepted standard designed to protect you and help to reduce or eliminate de-hire charges at the end of a vehicle contract. So you should always know where you stand. As always, it’s wise to start the preparations early. For a start, check out the guide at least eight weeks before the end of your lease. If you don’t have one, you should be able to request one from your lease provider. damage to wheels and trims. What’s considered fair wear and tear on a leased vehicle? Fair wear and tear occurs when normal usage causes deterioration to a vehicle. This is not to be confused with damage, which occurs as a result of a specific event or series of events such as impact, inappropriate stowing of items, harsh-treatment, negligent acts or omissions. Below are examples of what could be considered acceptable wear and tear. Order a copy of the British Vehicle Rental and Leasing Association (BVRLA) Fair Wear and Tear Guide, or read it online, at least eight weeks before the end of your lease. You need to give your car a good clean first before conducting the assessment so that you can see any damage. You will incur penalty charges for returning a car with excessive dirt, stains or odours, so it will require cleaning anyway. Consider having your professional car valet, especially if you haven’t invested much time in cleaning it over the lease period. Have a good walk around the vehicle, closely checking the panels, roof, bonnet and doors for dents and scratches. Check the tyres, trims and spokes for damage. When assessing your car make sure the weather is good. The car should be dry and assessed in good daylight. If the car has raindrops on it, finding paint imperfections and dents will be difficult. Be sensible in your evaluation and take the opportunity to put right what could cost you more at lease-return. A good checklist is essential for accurate evaluation. If in doubt ask a friend to help. 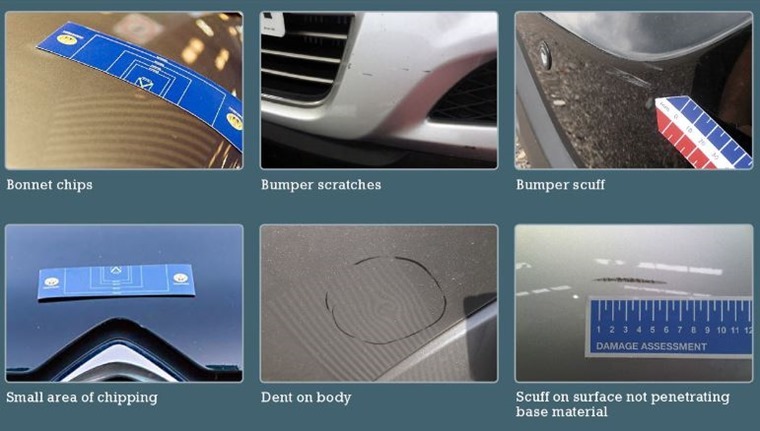 Any damage on your car that exceeds fair wear and tear as outlined in the BVRLA guide should be rectified properly by a professional. Do not be tempted to try your luck with the inspector. Ultimately, the best way to avoid penalty charges at lease-end is to take better care of your car from the start. Always maintain your lease car along the guidelines provided in the owner’s manual from the manufacturer. What happens if a leased car windscreen cracks?